Wow. Featured author for my debut novel. I’m still having a time getting my head around this concept. It’s lovely in a surreal, when do I wake up? kind of way. See, I never dreamed of being a writer. I didn’t read romances as a teenager. Honestly, I didn’t even much care for fairy tales. Yet here we are. In this surreal, when do I wake up kind of place. I am a writer. I do write romances. And my first one, FALLING IN LOVE, comes out in two days. Holy…cow. After years in the military, Chris Montgomery is looking for somewhere to relax and recharge, and Lambert Falls, with its tree-lined streets and picturesque town square, seems ideal. Chris expected that a stranger in town would attract suspicion and gossip. He didn’t expect to meet someone like Angie Kane, with her warm, open smile and self-contained air that are instantly intriguing. The one in my heart is more along the lines of: I’m going to write the story of the woman who isn’t a size 2, doesn’t want to be a size 2, enjoys her ice cream and her cheeseburgers and still gets the gorgeous guy! Even though she’s sometimes tired, sometimes grumpy, and doesn’t always say the right thing, she’s worthy of the good life she’s built, the friends she has and yes, the handsome Green Beret, who is the talk of the town. ‘Cause I’m wicked tired of couples where he’s a goof/idiot/comic relief/unattractive/insert whatever here and she’s gorgeous, talented and perfect. Seriously, dude. So, it’s not as well-written as Kensington’s. It is just as honest. My blog, Curl Up With A Good Book…and Live a Champagne Life on a Beer Budget, actually deals with a similar vein. It acknowledges we aren’t all perfect with perfect lives. That we are stressed and short on time and far from perfect. Yet we all still carry the dreams of the lives we read about ~ whatever we read ~ when we were girls. That we are worthy of treating ourselves well, of taking time for ourselves, of creating those lives, in little steps and little ways, every day. Be sure to check it out at: www.PaulineTrent.com. I’ll be posting new tips every Monday, with the occasional contest, too! Unfortunately, there is no Green Beret as a prize. And there you have it. 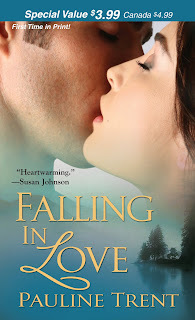 My featured author blog for my debut novel, FALLING IN LOVE. It’s available a lot of places, including Borders, Powells and online…until I wake up, anyway. Remember, curl up with a good book and live a champagne life…even on a beer budget! CONGRATULATIONS on your debut novel, Pauline! Don’t wake up–just keep dreaming those wonderful dreams!! Argh! I can’t seem to get my sign-in to change. This is Genene who posted the previous comment. When I fell in love with romances, neither hero or heroine were perfect, they were real people, living real lives. The characters were described as people I could meet in the grocery story, though a tad opinionated, and focused on following their dreams. Of course, I really don’t know for sure, I never interviewed the people in the grocery store. Maybe they are the real heroines and hero’s, of romance, without the glitz. Continue to follow your dreams! Congratulations, Pauline! Your book sounds terrific! Raise a glass of whatever to the dream!